Today we publish our new report – Good work, wellbeing and changes in performance outcomes – that focuses on good people practices in the NHS. 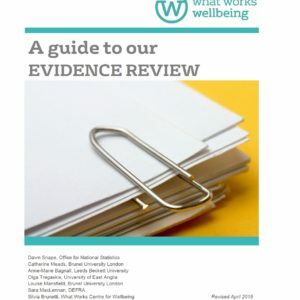 In this blog our Director, Nancy Hey, delves into the evidence on what makes work good for our wellbeing. The UK’s historically high employment rates are good news for our wellbeing. Being in work is, on the whole, good for our wellbeing, beyond just the income it brings. But being in a high quality job is miles better. This is a strong finding that holds across nations and time. We can also see from the evidence that life satisfaction dips when we hit working age. This matters not just because work is where we spend a large amount of our time, but also because what happens at work rarely stays at work: it impacts our home and social life, and our families and communities. If we can better understand the role of work in people’s lives, and what can be done to improve it, we could make a real difference. How can we create better work, in the present and the future? As the Good work report we launched today shows, improving wellbeing at work makes staff engagement sustainable, and supports higher performance and productivity. It found that NHS Trusts that made the most extensive use of good people management practices were over three times more likely to have the lowest levels of staff sickness absence and at least four times more likely to have the most satisfied patients. The Department for Business Innovation & Skills released a review BIS review of worker wellbeing and workplace performance outlined 11 characteristsics of a good job, which we’ve outlined in our employer factsheet. If job quality merits increased focus, and to emerge as a national priority, ideally we need the best possible data to make better policies. So, what might tracking and measuring job quality look like in practice? 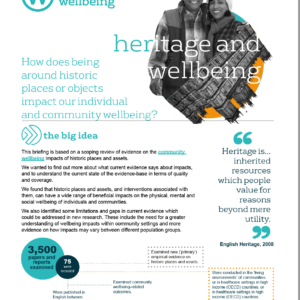 We looked at this as part of our Local Wellbeing Indicators, and now we are also involved in a new short-life group established by the Carnegie UK Trust and the RSA. Improving job quality is stubbornly hard to do but there are things that can be done to improve it. Pay is important, especially at lower levels of pay, but has diminishing wellbeing returns. There are people in jobs who are a lot happier or a lot less happy than you’d expect when you look at salary. There are high numbers of people who are disengaged from their work in Western Europe. Job characteristics that matter include income (with diminishing returns), physical safety, social connections (especially peers but also managers), work/life balance, content of the job (variety, learning, autonomy), opportunity and voice. Interventions to improve job quality rarely do so on their own, but there are things that can be done alongside by individuals, teams and organisation-wide that can help. We are doing some cost effectiveness calculations on this now. → What works to improve job quality (and performance). People who are very engaged with their jobs and report high job satisfaction often trade off a lot of things including stress and work/life balance. You can have a high quality job in a range of roles and sectors. It matters how long the course is. Job quality matters for young people who have been unemployed and who move back into employment in a poor quality job . Lower educational attainment doesn’t always lead to poor wellbeing. Some parts of the country are able to achieve better outcomes in this area than others, including through a focus on job quality. If you have any thoughts on how job quality should be measured, let us know in the comments below, on Twitter (@WhatworksWB) or in our expert network.